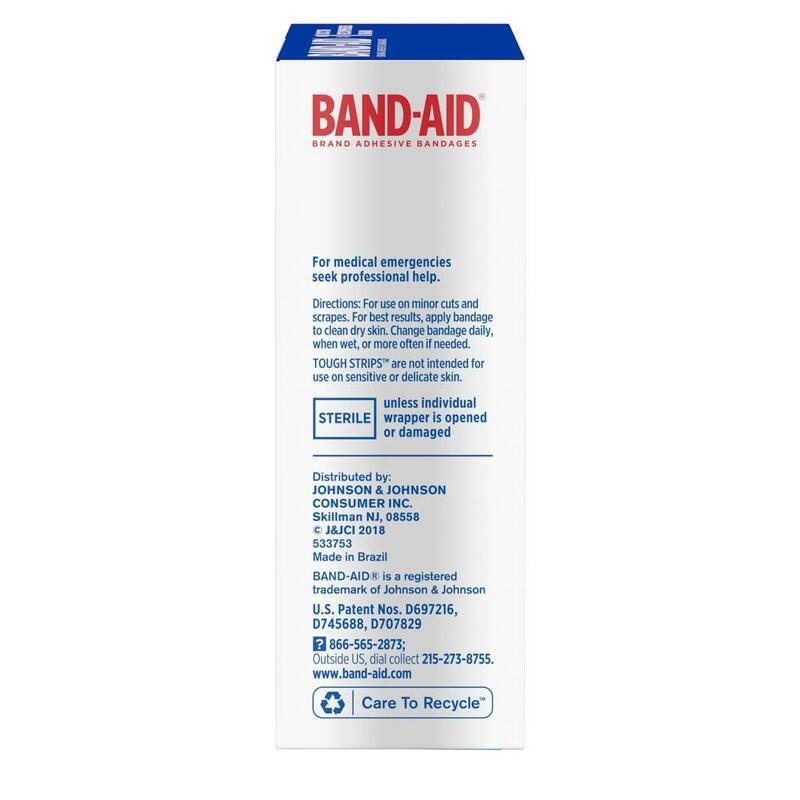 BAND-AID® Brand Adhesive Bandages provide first-aid care by covering and protecting minor wounds. These BAND-AID® Adhesive Bandages have QUILT-AID™ Comfort Pads that wick away fluids without sticking to wounds. 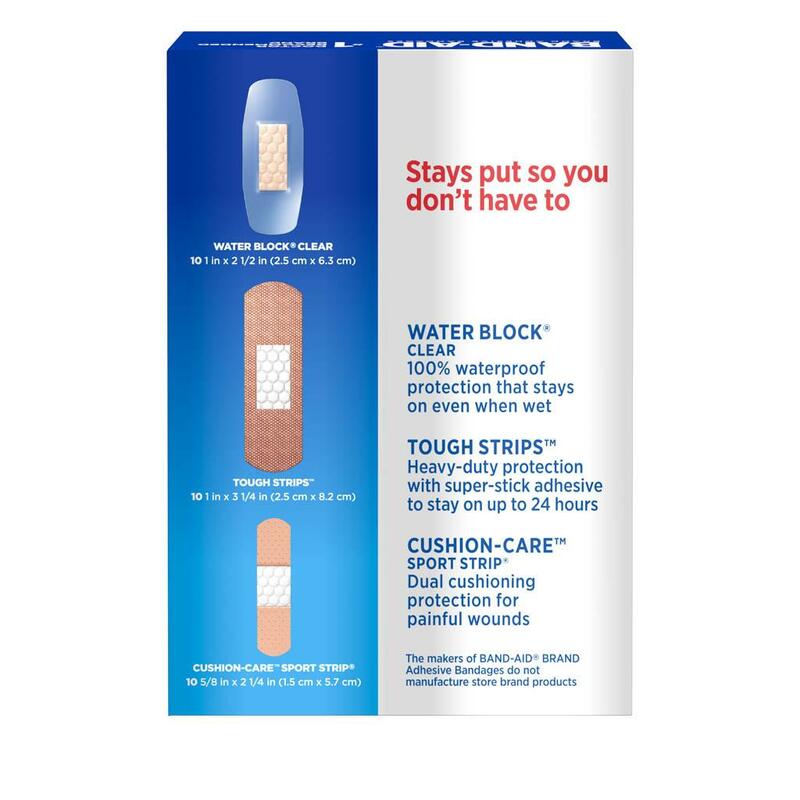 This bandage variety pack contains 10 each of three different types of sterile bandages: WATER BLOCK PLUS® bandages, which are 100 percent waterproof and stay on even when wet; BAND-AID® Brand SPORT STRIP® Bandages, which provide cushioned foam protection that moves with you; and BAND-AID® Brand TOUGH-STRIPS™ Bandages, which are made of heavy-duty fabric and have a super-stick adhesive. This assorted bandage package contains 30 sterile bandages designed for active lifestyles. 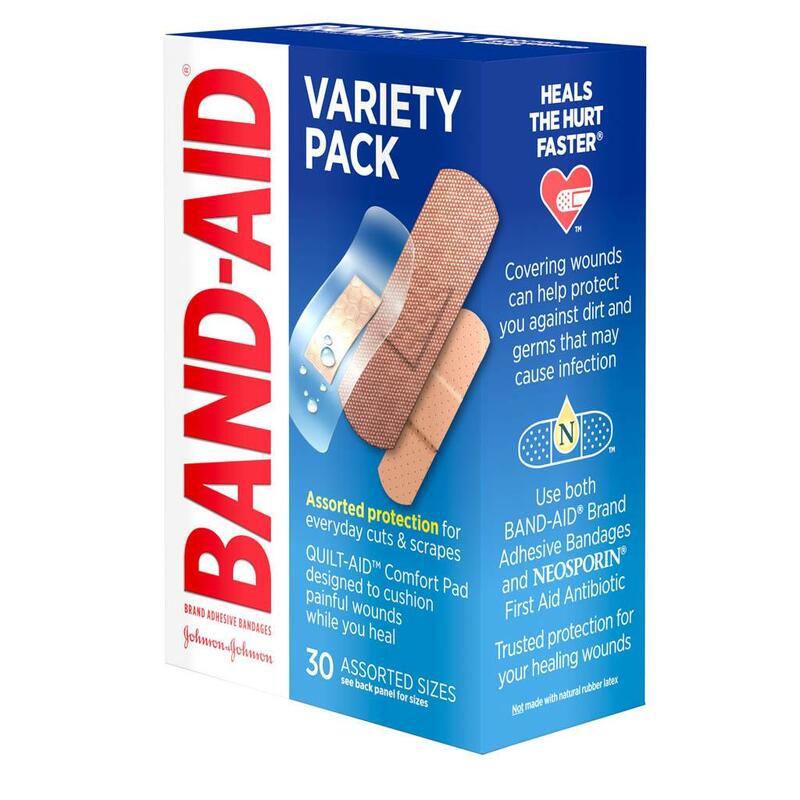 BAND-AID® Brand TOUGH-STRIPS™ Bandages are not intended for use on sensitive or delicate skin. My daughter has never had an allergy to bandaids before but the waterproof ones caused a horrible reaction where the adhesive parts were. It took two days to go away! And the tough strips cause my child horrible pain and bruising when they were removed. Should come with a warning - not for kids! We're so sorry to hear about your child's experience with our bandages and we'd like to see how we can help. Please give us a call at 1-866-565-2873, Monday - Friday from 9 AM to 5:30 PM ET. We hope to talk soon! My wife used a waterblocker band aid and it is way too hard to remove, removed the skin on her hand. 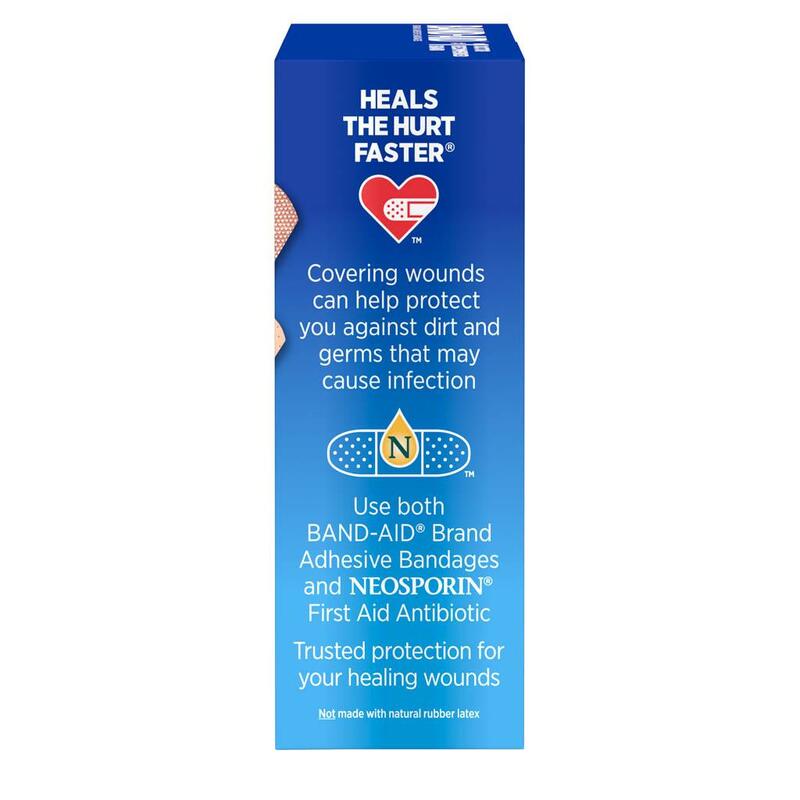 Band Aid needs to use a different adhesive, this is a terrible product. Thanks for letting us know about this! We're so sorry to hear you're wife experienced this with our bandages! We'd love to chat more about what happened and see how we can help moving forward. When you have a chance, please give us a call at 1-866-565-2873. We're available to talk Monday - Friday, 9:00 AM to 5:30PM ET. We're looking forward to your call! I had the smallest bandage offered in this variety pack on my arm and when I went to remove it two chunks of my skin came off. My cut I was using it for was beginning to heal and now I have a new wound to take care of. I am very disappointed with this product. Hi Tylove, we are very sorry to hear this and we are concerned about your comments. We would greatly appreciate the opportunity to learn more about this incident, and we ask that you please call our Consumer Care Center at 1-866-565-2873, Monday through Friday, 8:00 a.m - 8:00 p.m. ET. We look forward to speaking with you soon. I love the sport strips!!! They're super sticky, and really comfy. Thanks Band-Aid!!! This bandage has three product as it is a varity pack, assorted.This pack of bandage looks great for me.